As quilters we know how much time can go into making a quilt. This is also a reason why I like to develop fast quilting patterns. Yes, they may still take a few days but a lot of times us quilters will get surprise events that you may need to make a quilt in a short period of time. Examples are a new baby, birthday, graduation, someone getting married, sick, or what I've recently went threw was a friend of ours bought a new house. This is also why I like working with pre-cuts, it does save a little bit of time when making a quilt since a part of your cutting process is already done. So back on track, here is a block I recently made. In your head tell yourself which block would you rather continue to piece together to finish your quilt? Left or Right? My choice, the right. Why? Well this block is now squared. The left block was pieced nicely but while sewing triangles on the bias it stretched a little. (Hey we all make mistakes =P) Once all your blocks are squared and you are ready to piece them together in rows, then sew your rows together you will get a more "squared" quilt. IF you where to piece the left block together into rows and sewing your rows together, your quilt will be irregular. Squaring up a finished quilt top is a lot harder to do then squaring up individual blocks. Plus here is another thought, If you plan on adding borders to your quilt, a squared quilt will be easy to add borders to. An irregular quilt will give you some troubles and still leave your quilt wonky. Here is another good example why you want to take the extra time in this step. So you finally finished making a quilt top, now it is time to quilt it. Rather you quilting or having a long arm quilter quilt it, a square quilt will give you a much better look and out come! Where a irregular quilt will cause a few troubles for both you and/or a long arm quilter. What type of problems you may ask? You could get puckers, maybe a wrinkle, a wonky quilt. If you plan on quilting something in borders, sashing, or even in a block for a "custom" look the quilting pattern can also become irregular. We all want our finished quilts to be WOW-ED! Taking a small time in squaring up a block will surely give you the wow factor you are looking for and an easier process for the rest of the quilt. 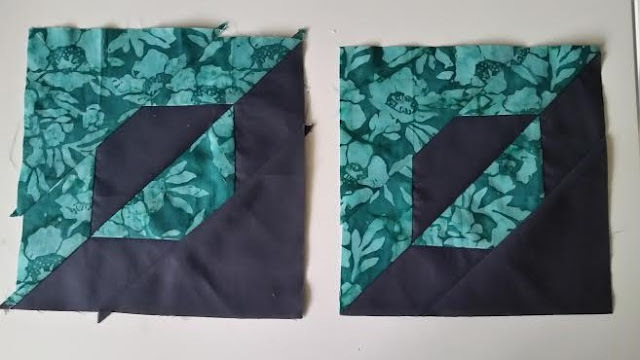 Recap - As I mentioned in the beginning rather you need to make a quick quilt or you have all the time in the world to finish your quilt project, I believe squaring your blocks is a step any quilter should not miss. Now you might think that every piece you sew, you may want to "square" it up. Do you need to? Personally I think not really UNLESS it is already becoming a wonky block. I only trim blocks once as the final block before piecing blocks into rows. So now you might be thinking what tools you may need to trim a block? Here are my three favorite tools I use when trimming blocks. 1. A rotating mat. Mine is a Fiskars self healing 13in rotating mat. A couple years ago I got this for about 70% - 80% off I can't remember exactly he price but I do know it was a HUGE deal with sales, and a coupon I had. Plus a lot of the blocks I make usually end up 12 1/2" or less so this smaller one was a perfect size for me. 2. 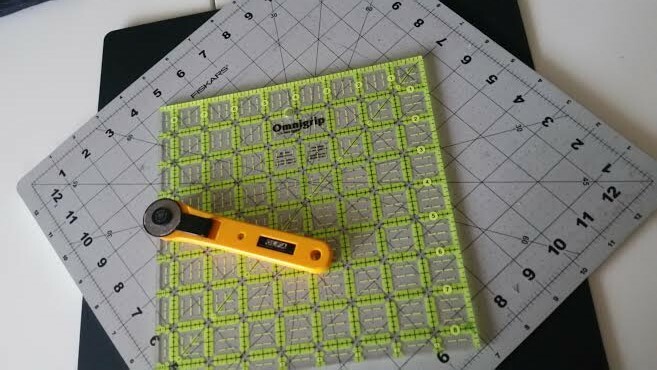 Omnigrip squared ruler. If you are starting off I recommend getting a square ruler that at a finishing size you mostly make. Personally I own a 6 1/2", 8 1/2", 10 1/2" and a 12 1/2". But I make TONS of quilts. There are also packs in which you can buy squared rulers in different size at a discount too. 3. A rotary cutter. Pretty simple, if your already a quilter than you already have one! lol I personally like to use a 28mm rotary since it is lighter and smaller. It just faster for myself to do so but a 45mm and 60mm would do just fine, Just make sure you have a sharp blade and WATCH YOUR FINGERS! Stay safe with any rotary cutters. Click here for these major sales! Olfa Rotary Cutter in many sizes for 32% + sale. Olfa Quick Change Rotary Cutter on CLEARANCE! Ofla Rotary Blade Refills in many sizes for 35% off. Ofla Rotating Mats on sale for 30% off! Hi, Krystal! Sometimes I square my blocks, and sometimes I get lazy and skip that step. My quilts are always better and flatter when I trim, though. I just hate doing it! Sigh.